arah Perschall, a National Park Service staffer at the Sandburg Home, welcomed the crowd. local volunteers staffed a voter registration station. a couple from Sudan received congratulations from immigration and park employees who run the ceremony. Svitlana Eadie Eadie, who hails from Ukraine, is about to celebrate a decade of living in Asheville, where she’s the accounting manager for a land surveying company. Here, she’s shown with her son, Alexander. Zamudio was born in Mexico and lives in Franklin, where she’s been working as a cook for six years. Her present job has her prepping American food; before that, it was Italian. The historic home of Carl Sandburg, who was both a son of immigrants and a champion of America’s blend of cultures, hosts the annual naturalization ceremony. 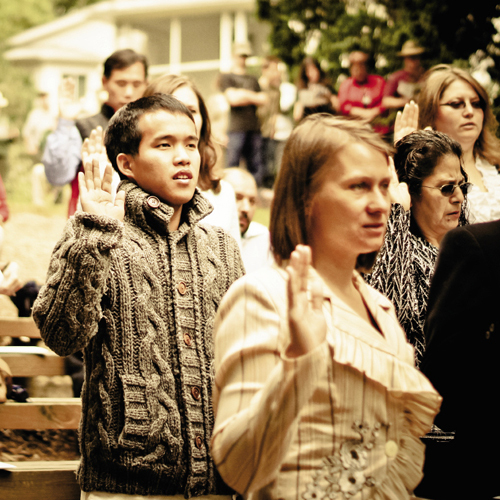 WNC’s newest citizens convened from points around the region to make it official. The United States accepts about a half million new citizens per year—a couple dozen of them via this Flat Rock ceremony. Carl Sandburg was born in obscurity in Illinois in 1878, the son of impoverished Swedish immigrants who’d come to the United States seeking the promise of freedom and prosperity. By the time he passed away in 1967, he was renowned as one of America’s greatest folklorists and writers, and his longtime home in Flat Rock was promptly named a National Historic Site. For the past five years, the Carl Sandburg Home has hosted one of the few naturalization ceremonies for new U.S. citizens in Western North Carolina. The annual event, held in mid September, has become a unique tradition in its own right. Last year’s ceremony was equal parts quaint and compelling. A relatively small gathering, it brought to Sandburg’s mountain haven a global cast of participants: 24 individuals from 14 countries, including Canada, China, Ecuador, India, Indonesia, Mexico, Moldova, Poland, Russia, South Korea, Sudan, United Kingdom, Ukraine, and Vietnam. Each had completed the sometimes arduous process of becoming a U.S. citizen. After taking oaths of allegiance to the nation and its flag, the new citizens began to slowly file away. They shared a few happy tears and hugs with family members, stopped by a table where they could register to vote, and fielded a small barrage of questions from local reporters. WNC asked a few of them to share what it meant to become an American.